Great for people in their 30’s, 40’s and 50’s who want to regain the freedom to move, and more importantly, retain the freedom to move till their 60’s, 70’s and 80’s. Increase your performance and reduce the chance of injury during kettlebell training, CrossFit, martial arts, or other physical activities. These may be the only stretches you’ll ever need to work the whole body from every angle, injury-proof yourself, increase range of motion and strength at the same time. Comes with alternatives and detailed descriptions. These are not some collection of what’s cool or the hip thing to do, these are the movements, exercises, and stretches that I’ve been using for years, and will keep using. As a hiker, BJJ practitioner, crossfitter, kettlebell enthusiast, and heavy lifter myself, I sometimes experience joints out of place. After performing some of the movements covered in this book I hear/feel things moving back into place. With that said, I’ve not had to visit a chiropractor for many years. I certainly think that there are some good chiropractors out there, and for certain people who lack the knowledge, a chiro is highly recommended, even by me, someone who prefers to rather gain the knowledge and/or handle everything himself. This book explains the movements, it gives you ideas, it does not, however, program the exercise for you, i.e. do this many reps, repeat for this many rounds, hold for this amount of time etc. There is a reason for it. Programming is specific to the person, there is no one size fits all. Hence, I explain the exercise, give ideas on how to use them, it’s up to you to program them by listening to your body. Before you go buy this book thinking that this is about gaining huge muscles and insane strength, allow me to explain why I have the word “strength” in the title. The strength you will gain from this book is that which is hidden in the form of isometric contraction, core strength from some of the movements, and strength from the small section dedicated to mobility through resistance. I mention this now as I don’t want to disappoint you. If you’re after a good book to gain strength, search for THE BIG FOUR strength program or Master The Kettlebell Press, all by Cavemantraining. If high-quality, photo model, top-notch photography is what you’re after, don’t buy this book. Again, I want you to get what you’re after and not be disappointed. I basically shoot my own photos, either on a timer, or with my wife or son. I then process them through Lightroom and play with it, I enjoy this process. I did not hire some hotshot photographer to make the photos. One day when these books start paying enough money to live off, I will hire some photo models and a hotshot photographer and redo all photos. For now, these will have to do. This is the stuff you need to do to feel and move well. We all know how to do the bicep curls, bench press, deadlift, and whatever else to look good, but we tend to neglect the work and time we should invest in ourselves to give back, to stay injury free, to move better, and all this will translate into better performance and results in other areas of your life and training. 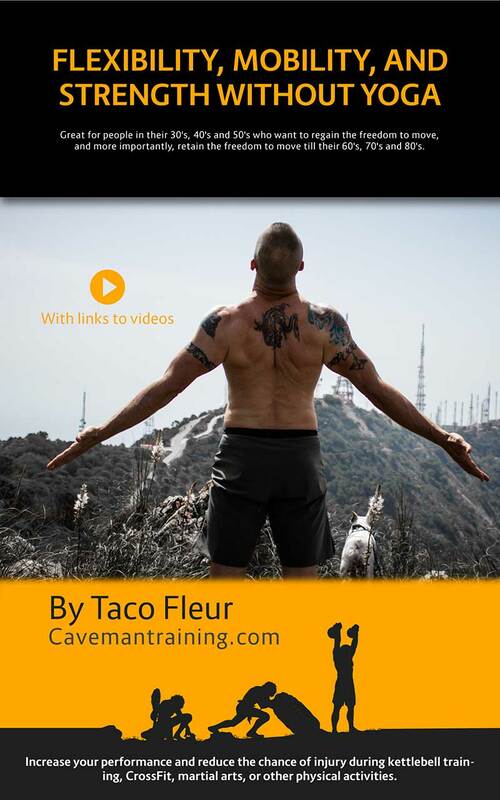 All the exercises in this book are explained, but as an added bonus I include some videos to cover additional movements that are not part of the book. Cavemantraining publication are always easy to read. Simple, efficient and most of all : usefull ! You’ll get a nice guide, video supported, to develop your own flex/mob routine according to your needs. Explanation on how to move properly during the exercises and which muscles are into action. Good information to follow on a daily basis. Carrying a load of weight in my gut since adolescence has ,over 25years, led to chronic tightness and pain. A constant need to crack my back but a bigger fear to try. The first stretch in this book alone relieved the muscles in my back and i could feel my spine pop, pop, popping in to place! As a whole, these moves are far better than what I was doing, and along with swinging good old American steel, im feeling solid in muscles ive never felt before! Thanks John, seriously happy to read that it has helped you already. I highly recommend this book. The information is presented in a detailed, straightforward approach that will guide you in the right direction toward becoming more flexible, stronger and conditioned to help avoid potential injury as a result of high intensity sports activities or simply to just feel and perform better as a functional human being.